ELVIS "Bomber" Moyo is back in Harare in just over two weeks' time when Friday Night boxing Series returns to these shores with what appears a mouth-watering boxing bill. 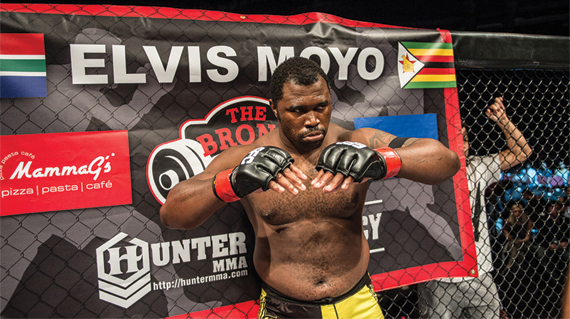 Moyo, who is based in South Africa, was last in the country at the end of January to defend his World Boxing Federation Africa heavyweight title at the Harare City Sports, which he did successfully with a points victory over Congolese Knife Didier. He returns to the same venue on April 27, when he faces tough Ukrainian journeyman Maksim Pedyura in a headline fight of an event promoted by Kalakoda Promotions and Kwesé Sport under their Friday Night Series banner. According to Kalakoda, the event dubbed Kubatana, forms part of the country's national independence celebrations. "We will be bringing a series of super events to Zimbabwe this year," Kalakoda's Saul Loggenberg said. "Each event is a notch up from the previous, and our decision to feature and revive the Zimbabwe national titles forms part of a long-term strategy to position Zimbabwe as an African boxing center," he added. The fight bill has a good mix of up-and-coming and established Zimbabwean talent, and features two national titles. However, it is crowd favourite, the Bomber's clash against Pedyura which would be of huge interest to local boxing enthusiast, after his impressive showing in his two previous visits to the capital where he won and defended his title. Following his successful title defense in January, Moyo publicly called out fellow Zimbabwean Dereck Chisora, and will need to beat Pedyura — and in style - if he is to impress his countryman. "We have a plan and Pedyura is just another obstacle in my path to where the Bomber is going," Moyo said confidently. "He will not derail our plans; it will be a nice test for me and I am very confident and feeling razor sharp. After the disappointment of my fight in Austria not happening, I am now more than ready for action and want to send this guy back to Europe in a bodybag." The main event sees local favourite Tinashe Muvhadze taking on Ronald Tamani for the now revived and coveted Zimbabwe Super Bantamweight title. The other title fight is a lady's bout between Monalisa Sibanda and Chiedza Homakoma for the lightweight title. The remainder of the bill is completed by an interesting super middleweight bout between Wesley McDade and Chris Bobo from the DR Congo, as well as crowd favorite and reigning WBF African Cruiserweight champion Sting Gondarena, who takes on Djokito Sakuji from the DRC in a non-title bout over 8 rounds. Zimbabwe Boxing Board of Control chairman, Richard Hondo said: "This is fantastic for Zimbabwean boxing, we applaud the efforts of Kalakoda Promotions and Kwesé Sport, boxing is now alive and kicking in Zimbabwe and we look forward to a fantastic event on April 27." "These events are becoming a key part of how we activate the Kwesé brand in Zimbabwe, they provide a fantastic platform for local Zim and African talent, and a means to show the rest of Africa that Zimbabwe is open for business and the new mecca of African boxing," Kwesé manager Dorothy Zimuto said.